Getting to head from the acoustic set to watching the band dressed in 90â€™s country disguise as they opened for themselves as Hot Country Knights. I donâ€™t know if I have ever laughed so much. 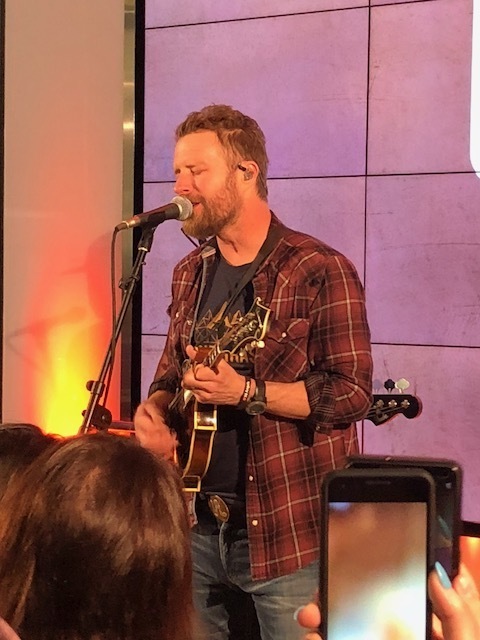 Partly because they are out there having the time of their lives acting like goofs, partly because at least half of the crowd didnâ€™t catch on that this was in fact Dierks Bentley on stage, and that it was meant to be a spoof. The music was spot on though - who doesnâ€™t love a medley of 90â€™s country throwbacks? The show of course was awesome. This is the seventh time Iâ€™ve seen him live, and I never get tired of this show. I will see Dierks every time I can, forevermore. ðŸ˜‚ Plus when you have Tenille Townes, our very own local country superstar opening, and Jon Pardi, who is so much fun to watch on stage, you cannot help but want to do it all over again the minute its done. I left with sore feet and ZERO voice, but singing every song at top volume was too much fun to stop for a second. That is living at its BEST. Which brings me back to today. Where I am tired, sore and voiceless, and I could not be happier about it.